Remapping subdirectories can be useful when either re-structuring your site or giving access to other users to alter specific subdirectories without needing to give them full access to the site. By using this feature, users have subdirectories of their sites use non-standard locations within the file structure as a new source for web content. You cannot use the remap subdirectory service to change the web directory for an entire domain. To change the entire web directory, you must edit the domain from the ‘Manage Domains’ page. It’s not possible to remap directories across different servers. You also cannot use the remap subdirectory service on DreamPress sites, as it will break the site. DreamPress URLs will not appear in the drop-down list for this feature. CGI scripts won't work in subdirectories remapped to other user's home directories because of file ownership issues. PHP scripts won't work in subdirectories remapped to other user's home directories because of PHP security limitations. Trying to run a script across users just loads a blank page with "No input file specified". PHP scripts in remapped subdirectories (within your own home directory) can only run with the server's default PHP version. In the following example, the remapexample.dreamhosters.com/pictures subdirectory will be remapped to a different domain and directory named example.com/newpics. Click the Edit button to the right of your domain. Under the ‘Users, Files, and Paths’ section, find the ‘Web directory:’ field. Use this directory path to your website. 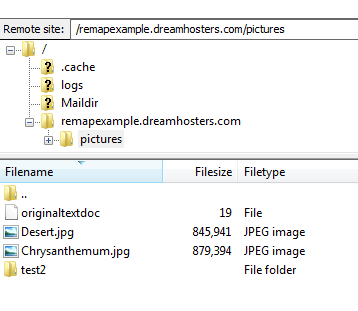 The ‘Web directory’ is /home/dh_user/remapexample.dreamhosters.com meaning that Internet traffic would go to that directory when attempting to reach the main site. If someone navigates to remapexample.dreamhosters.com/pictures, then according to the web directory set up already they would be directed to /home/dh_user/remapexample.dreamhosters.com/pictures for content. Use the same directions above to find the web directory for the domain you’re going to use to remap. example_username is the user for the domain. 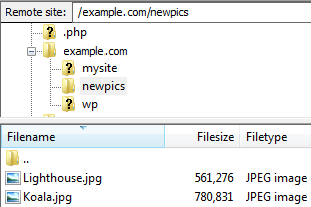 This means that the full path to the /newpics folder would be /home/example_username/example.com/newpics. Once you know the web directories for both domains, you can proceed with remapping the subdirectories. Choose your domain from the dropdown list. In the field to the right, type in the directory you wish to remap. New path on [servername]: Choose your second username from the dropdown. Then type in the full path to the second domain to remap. Click the Remap this sub-directory! button to save. This may take up to 15 minutes to update on the server. In this example, remapexample.com/pictures is remapped to example.com/newpics. /home/dh_user/remapexample.dreamhosters.com/pictures now references /home/example_username/example.com/newpics for web content. If this subdirectory was not remapped, the Desert.jpg and Chrysanthemum.jpg photos would be showing instead. 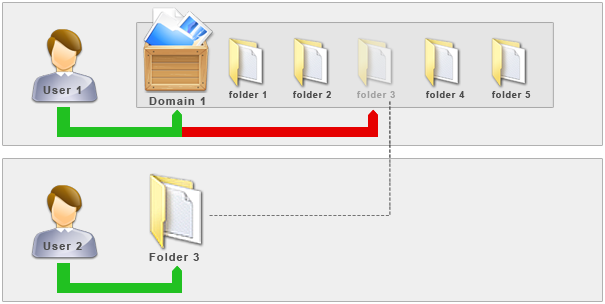 This means that although the original user still has access to the file structure, changes made in it no longer show online since this subdirectory no longer belongs to the original user. The second user for the remapped subdirectory controls this subfolder. As you can see in the above screenshot, there is another folder named /test2 within the directory that ended up being remapped. At this point, the test2 directory and anything within it as well would not be accessible online as traffic is no longer going to that directory. Further directories can only be added to the remapped subdirectory controlled by the second username.